It’s official 2015 open water season has begun and life is happy for yours truly. Next week is the GSL 1 mile swim and it will be my 4th year swimming it. 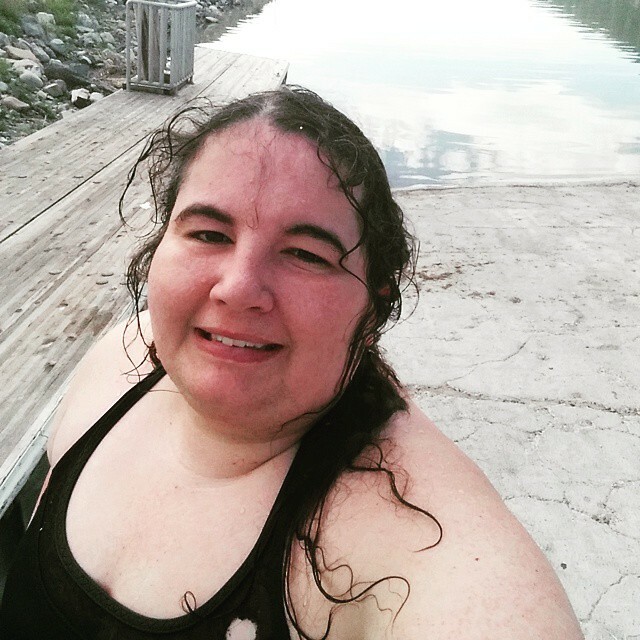 I am probably my least prepared for it but I had a test swim today and it gave me more confidence for next week. They said I swam about .9 miles today and it wasn’t too bad so I think it will be great for the race. Please pray I will be able to sleep next Friday because that could be a problem since the race is early in the morning. Today was the GSL Open Water clinic and it was a huge success. The water was very warm at 75 degrees. This is why they have the GSL swim so early in the year because the salt and position makes it heat up very early . 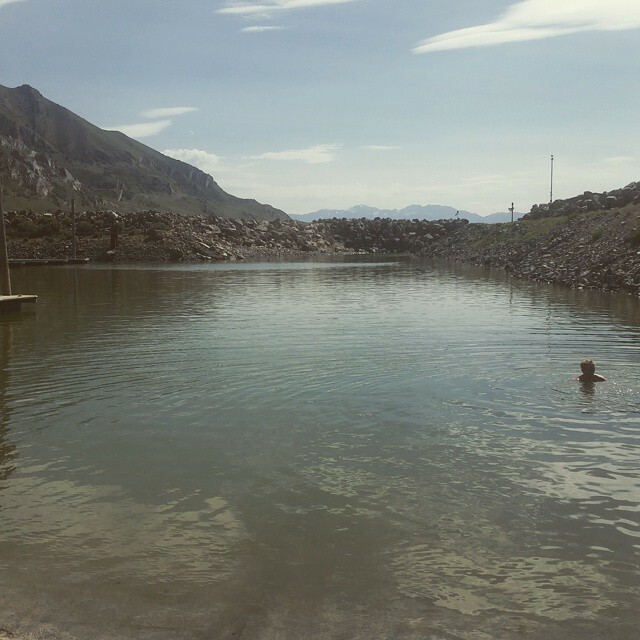 Getting in the Great Salt Lake is an experience. Your whole body reacts to the salt. Your nose and any other tender spots burn, your skin tingles and the water feels heavy like no other. As you are swimming you can feel the salt sucking strength from your body as you quickly get dehydrated with no relief. People think it is like the ocean. It is nothing like the ocean. 5 times saltier than the ocean in fact! It was so funny some tourists from New York asked us for tips during their stay and where they could buy “local shrimp”. I didn’t know what they meant at first and realized they were talking about the brine shrimp! These are microscopic organisms that live in the Great Salt Lake, the only living organism in the lake. Certainly not the kind of shrimp they were hoping for! This year the water is very shallow and it seemed extra potent. It’s so shallow they had to take all the boats out and have them in the parking lot. We started at the marina and then they had about 5 buoys set out going towards the south beach. The GSL swim has always been a straight shot to the Black Rock beach but this year they are doing a loop to one of the rocky beaches because of the water (if they did Black Rock it would have to be half swim half run and I’d be out). I have decided this year to swim in batches of 50 and as I was testing out my stroke I think it will be good to alternate breaststroke and freestyle. Sighting is so hard in Great Salt Lake even with buoys and the current can be very strong. There is something so motivating about swimming breaststroke open water because you can see your target dead on. It is a little bit slower probably but it feels faster in the moment which is very encouraging. Open water is such a mental sport. It always feels like I am never going to get to the target. I tell my friends it feels like you are on a swimming treadmill. Even when you are very close it seems like you aren’t going to make it to the final destination. But today I went out of the marina area and then about a half mile and then swam back to the marina. Gordon told me it was .9 of a mile so pretty close. This has given me great encouragement for next Saturday. 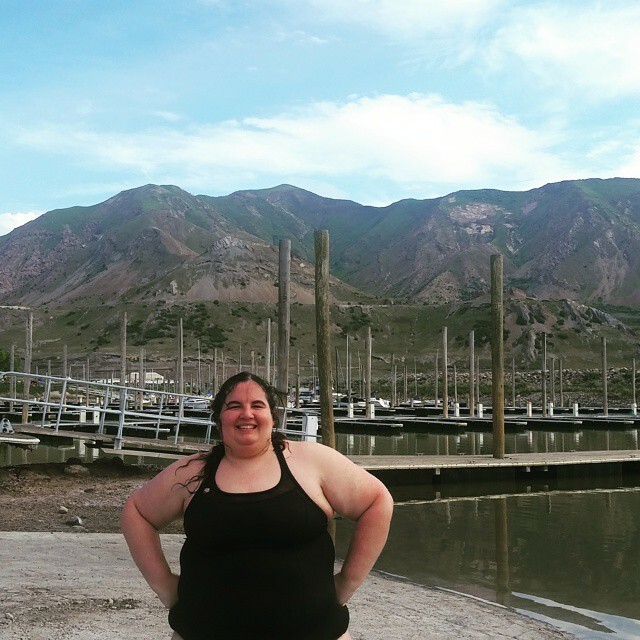 I was really nervous since I haven’t swam open water since last July but now I feel confident. I’ll be tired but I know I can cross the finish line! My friend Etsuko is swimming open water this year (hurray!) and her friend could not understand why we would get in that stinky ‘cesspool water”. It’s hard to explain. Sometimes the swims give me anxiety and stress me out but there’s nothing like the feeling of finishing especially at GSL. There is something about the human experience that needs to occasionally do hard things. And people don’t expect a big girl like me to do something hard. With my feet issues I can’t run or do anything like that so when I first went to open water it was like finding my home. It was where I belonged with all the other misfits who love the water. 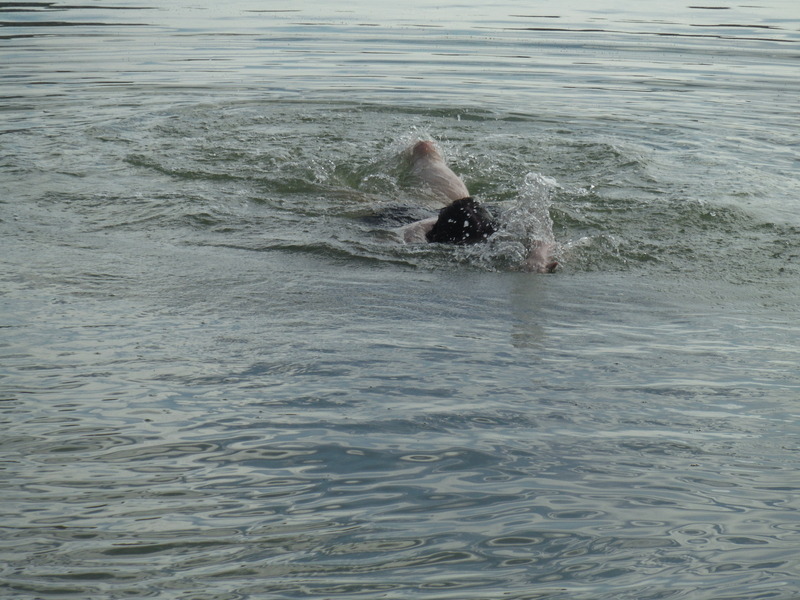 Even among swimmers a very small percentage do open water. I’ve had so many people I’ve taken to the lakes and they hated it. It was dirty. It was gross. It was cloudy. But then every once in a while there will be someone like Etsuko, my friend Abby or myself who love it. We love the challenge. We love being out in nature. We love the unpredictability. We love the comradarie and family but at a certain point we just love it. It’s like when you love key lime pie you can say a few things that you like but it in the end comes down to your taste buds just like it. Same with me and open water. It is hard. It makes me nervous and I doubt myself sometimes but I love it. It fits me and I am SOOOOOO Excited for the summer. I hope you can all find your athletic match and hopefully it can be outdoors enjoying the beautiful, crazy and sometimes stinky world God has given us. Stay tuned for tons of fun open water updates this summer and all the excitement of next weeks big race! Go SLOW! Today marks the end of an era in my life. It is my last official day working in accounting (at least for the foreseeable future). It’s been 10 years since I got behind a desk taking a simple secretarial job never dreaming it would dictate the next decade of my life. I still can’t believe it! If you had asked me when I was growing up or even in college if I would work in accounting for 10 years I would have said you were nuts. I’ve always been cluttered and bad at math. Little did I know that accounting actually has very little to do with math. It has everything to do with routines and organizing data. In some ways it was a good career for me and maybe not a surprise I ended up there. I am great with routines and am extremely fast at data entry. I am also someone that can do the same thing over again and not grow tired of it. I could eat the same thing, see the same movie and be fine. That part of accounting never bothered me. What was difficult was I seemed to be prone to errors especially at the beginning because it was all new. It seemed at first I was inventing new ways all the time on how to mess up the check run (I can’t believe no check runs! Wow!). These mistakes were always caught by one check and balance or another but it was still humiliating and it didn’t help that my manager at the time rubbed them in my face and made me feel ashamed of my work. She was the wicked witch of my life. Not only the worst boss I’ve ever had but one of the worst people. She manipulated me (and everyone else) so that I found myself apologizing when I had actually done good work. Imagine what it was like when I made mistakes. I put up with her for 3 years because I lacked the courage to quit my job but finally in December 2007 I had enough! In one of my proudest moments I walked out and into nothing to begin the great economic year of 2008 (seriously who quits their job in 2008. That’s how bad it was). Kierkegaard talks about the great leap of faith and how it has to be perfect or it is illogical to believe. That moment in my life was as close as I’ve ever gotten to the perfect leap. There wasn’t a doubt in my mind it was the right thing to do. Everything good that has happened to me in my life has been a response to that leap including starting this blog! I was unemployed and decided in May 2008 to blog how I was feeling. Honestly I felt like I needed healing after such an intense period (some of you may think I’m exaggerating but it was a time of deep depression and anxiety for me working in that job. Only God knows how tough it really was). At that time I graduated from my MBA and thought I would go work in marketing or maybe human resources but over 40 interviews and nothing. My Dad asked me if I wanted to help manage his properties and I did that full time for about a year (thanks Dad!). I learned that even if I was doing some accounting work I was happier working from home and being my own boss. I felt free and it was exhilarating. I also moved to Draper during this time. Then I got the offer to work part time in marketing for Grabber, which I did giving at warmers at local events (remember my old Grabber van?). But that was quickly dissolved and they needed help with accounting so back I went but this time I was working from home which was pretty good. My next boss Kevin was a delight and I began working full time for Impact, Grabber and my brother’s new company Poler. I would go up to Syracuse, Utah once a week and print checks and do other mind numbingly boring tasks that nobody in all 3 companies wanted to do. That’s the history of my time in accounting. Because I was so fast if there was someone who didn’t want to do something I would get the job which was generally okay with me. One of the worst projects was entering 27,000 lines of inventory into quickbooks for Impact. So boring! (it was then that I got into podcast listening because it distracted me a little bit without being too much). Then the company’s were sold and Kevin moved over to exclusively Impact while I stayed working for Grabber and Poler. Each week I did more and more for Poler until I was working for Grabber only managing their sales tax. I became the queen of sales tax. Then they sold Poler and eventually Grabber was sold to Kobayashi. In 2013 I went from working at Grabber to Poler full time and then to part time last summer. My boss at Poler is a woman named Kelly and she is a total delight. I will really miss working with her. The part time work was a little bit of a safety net as I am working 30 hours in my marketing work for Kobayashi and it gave me a full 40 hours with Poler but it feels good to sever the ties and focus solely on my new job. (well except for my Dad’s rentals). The problem with all of this work is it was never ending. I was grateful for it but because I worked from home there was no separation between my life and work and if I didn’t do certain things they just didn’t get done. In the case of accounts payable that is a major problem or payroll. It has to get done! 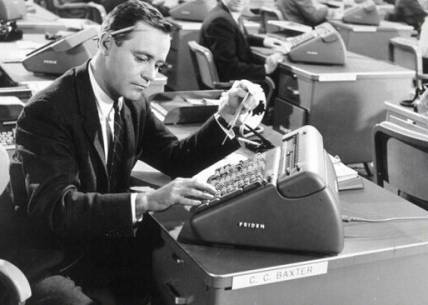 So there was many a time when I was sick as a dog and printing out checks or entering data into a computer in Hawaii or California. It was also sometimes hard to go home because my father was my boss and it meant I couldn’t relax because I was always working or thinking about work. No breaks. But I got to work from home so it was worth it. The very idea of going to back ‘cubicle Hell’ as I like to call it makes me nauseous. It will be very tough for me after working from home for the last 7 years. I pray every day that nothing will change in that department. Fortunately things are looking great in my new marketing job and I really feel like I have scored the job lottery. I couldn’t be more happy. Every day I am learning new things and honing my craft. It is so satisfying! I am nothing but grateful for those years in accounting. It was a journey I needed to go on and it sustained me for 10 years. It helped me buy my home and do so many amazing things. I never felt completely whole doing accounting and had decided it was just a compromise I was going to have to make in life. It was the card I had been dealt career-wise and at a certain point (8 years in!) you have to accept what God has given you and not be miserable all the time. So I am grateful but getting this new job has taught me to always maintain a sliver of hope. Good things do come to those who wait and work in the sphere God has set them in. I wasn’t anticipating a career change. It came out of nowhere but like I said it has been a dream come true. And now one door is closed and another is 100% starting, no safety net. I hope I can eventually be made full time with my new career but I will wait patiently and do my very best. In some ways it is actually nice having 10 more hours a week to do personal projects like my youtube channel (but I want the 40 don’t get me wrong!). There are times and seasons for everything and just like my accounting career morphed and changed I’m sure this new job will do the same. I can’t wait to see where it takes me! 10 years of accounting is done! Hurray! (I don’t know if anyone but me will read this rambling post but it is my story which I needed to write out). Sure love you guys and to 10 years of marketing! Just did a post over at the movie blog on Movies I Think are Boring. I think you will all get a kick out of it. If you aren’t following the movie blog please do. I think you will really enjoy it. Since I started doing this blog I have noticed a lot of my favorite movies others will claim are boring and yet movies they love I will find boring. In fact, I have moved away from using the word boring in my reviews (I call it the B word) because I find it doesn’t tell you that much. It’s kind of like calling something nice, a bland adjective. So what do I mean by boring? Well, basically a movie that puts me to sleep, that I found tedious and slow. A movie like Boyhood which others found to be boring to me was extremely compelling because its about real life. I could have watched that for days. Boyhood knows what it is trying to be so it is very compelling. I am a part of a new book club with some friends I met online. 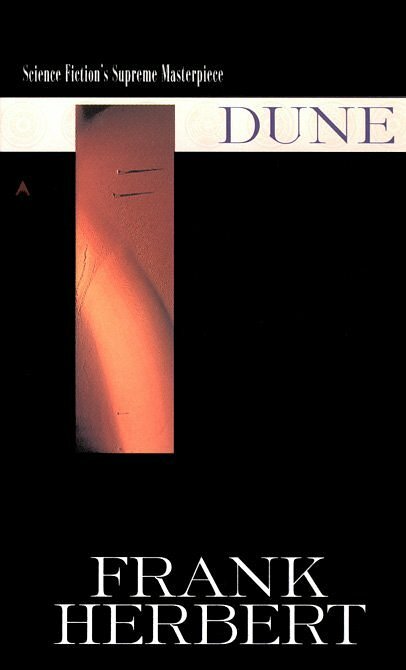 The most recent selection is called Dune by Frank Herbert. It is a science fiction tomb that I did not care for. Let’s just say I called it the “Phantom Menace of books”. It was so long and the characters never shut up. Far too much explaining about things I didn’t care about (a lot of carrying on about spices and trade) and no recognizable villain. I didn’t get that far in it because I kept falling asleep so I might be able to use it as a good insomnia cure. But I went to book club hoping to find out why a member of the club had selected it and why she liked it. Her explanation was very interesting. She said she liked that it was dense without being old English like a classic. Meaning something that was full of details and every time you went to it you got more about the world and characters. She also liked that it was thoughtful without being philosophical which evidently she hates. Anyway, it made me think about my own reading and what ‘dense’ books I like. One’s I could read 1,000 times and I’d still get new details and information. I can’t think of that many. Most books I like are pretty straight forward in plot and story. Not sure what that says about me but there you go. Here are some that came to mind. 1. 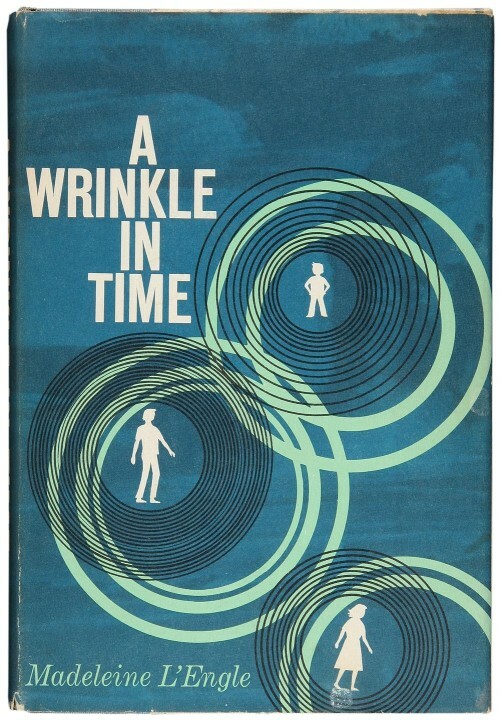 Wrinkle in Time- a book I didn’t like as a little girl but I read it fairly recently and loved it. It is very rich in detail and not sure what it all means. 2. 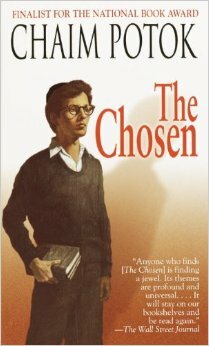 The Chosen/My Name is Asher Lev- this book isn’t dense in a way but the characters are so complex every time I read it I feel differently about them. When I read it in college I thought Danny’s father was a beast not fit to raise children. Later he didn’t make any sense to me and then I began to feel sympathy for him. So in the sense of its characters it is very dense. 3. 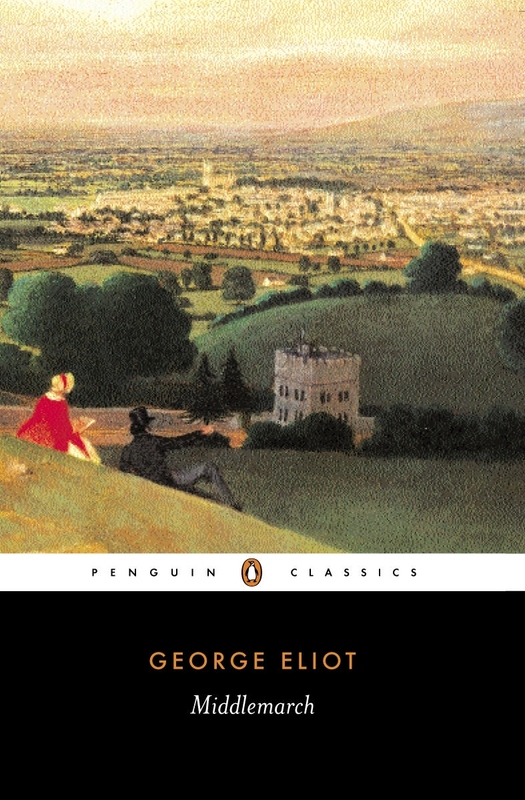 Middlemarch- You guys know North and South is my favorite book but it is a pretty straight forward romance. Middlemarch is much more complex. Dorothea Casaband is a layered character that is tough to understand. On one hand she is foolish and marries Mr Casaband despite outward signs of his miserly ways. She’s so hopeful of a thoughtful intellectual man buried deep inside. Then her interactions with Will Ladislaw seem so different than what she was looking for with Mr Casaband. It seems like she feels sorry for Will who has married a stupid woman but didn’t know any better. It’s the motivations of the characters and their behavior to one another which is very compelx in Middlemarch. 4. 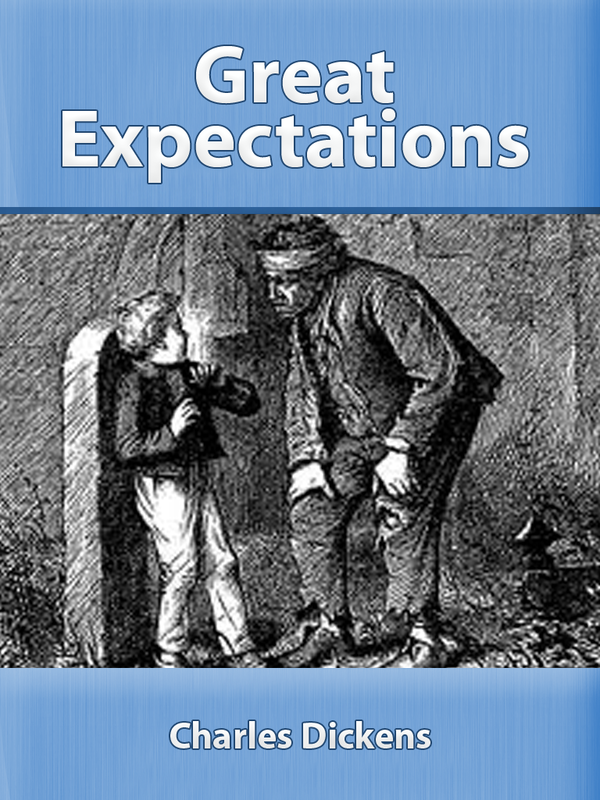 Great Expectations- My favorite Dickens (aside from Christmas Carol) and one of my favorite books because it is so different. You’ve got Pip all of the sudden given a chance to improve his life but from who? He assumes it is the bizarre Miss Havisham and her daughter Estella who sit in a mansion with a decades old wedding that never happened. When I read it I learn more about the characters. Why Pip does what he does. What Dickens is trying to say in his strange story? 5. 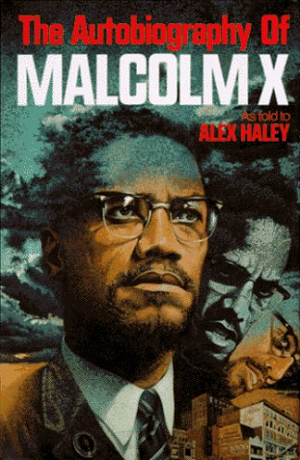 Autobiography of Malcolm X- This book may surprise you being on this list but it is one of the best autobiography’s I’ve ever read. Malcolm X is such a layered character and while I haven’t read it in a long time it is one I could read 100 times and get a new impression of him each time. He was a man who of many public personas that he was willing to abandon when he had change of heart. Especially for someone in the public eye that kind of change is remarkable. 6. 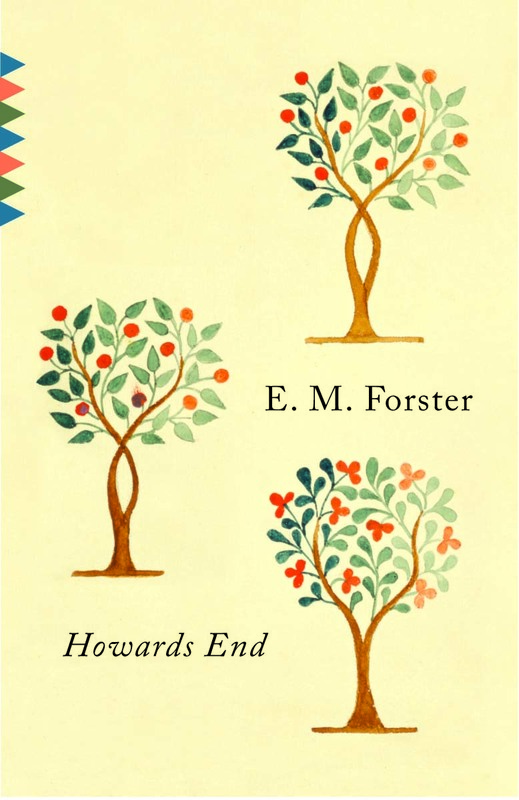 Howard’s End- Another book with rich characters. I love the different class bubbles each of the families are in and how that colors their view of the world. The Wilcox’s, Schlegals and Basts are characters I never quite figure out. They have positive traits but fall sway to human weakness easily. The mere premise is interesting too. What is it that Mrs Wilcox see’s in Margaret? Why does she give her Howard’s End? What was she trying to accomplish or did she just get along with her? It’s a rare movie about class that doesn’t tell you who is right or wrong but gives you the story and you decide. 7. 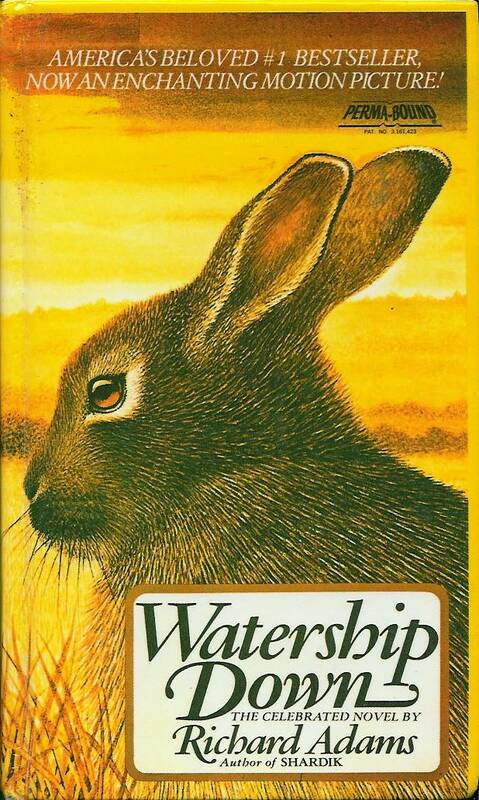 Watership Down- Another book that grew on me. Our troop of rabbits including Hazel, Fiver and Bigwig flee their home and come in contact with several societies including a communist like state and a totalitarian regime. On the surface it is an adventure story with the rabbits narrowly escaping death many times. But it is also a piece of social commentary on the flaws of various forms of government and how power corrupts absolutely. 8. 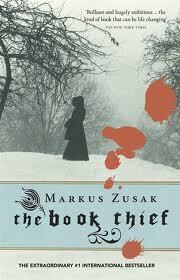 The Book Thief- Do I need to praise The Book Thief more on this blog? It is so rich. Everything from the narrator, to the complex characters, to the number of characters, to the setting in Nazi Germany to the book within a book, to the messages on politics, writing and family are astonishing. I love this book! 9. 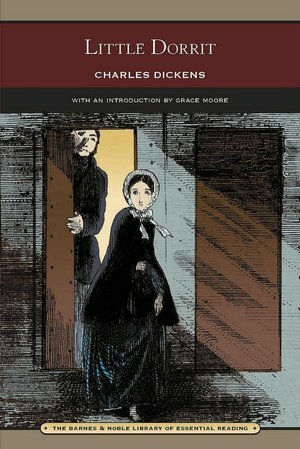 Little Dorrit- A lesser known Dickens book that I really liked. It’s very melancholy but with Dickens family living in a debtors prison it has a closeness to the story that you don’t quite get in any of his other books. The society that develops within the prison and William’s inability to adapt to free life is very interesting. Little Dorrit is devoted to her father but in a way also imprisoned by him. She could be such a cliche of a character but she isn’t because she consistently thinks of others before herself almost too a fault. The big reveal at the end and the house collapsing is so great. It’s a book that says a lot about human group theory and our desire to do the right thing in the eyes of other people even if it hurts us in the end. 10. 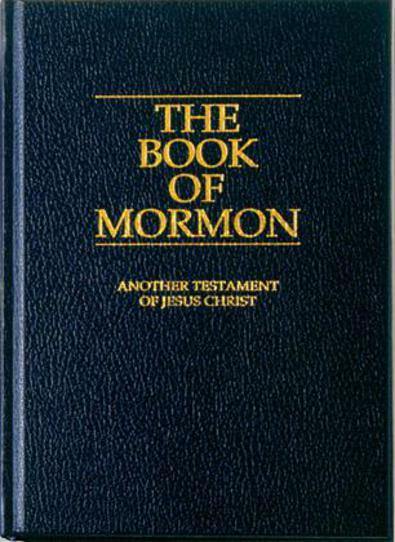 The Bible/Book of Mormon- I know this seems like an obvious one but it is absolutely the richest read in my opinion. What else could I read every day of my life and get new insight and inspiration from every day? But it’s not just the counsel that is rich. The stories are deep as well. There are lots of miracles that aren’t explained, characters whose motivations are complex like David. And of course Christ spoke in parables which are extremely layered and dense. By design we are supposed to work to understand the Prodigal Son or the Good Samaritan. What dense books do you like? It’s interesting how few of these books have been made into great movies- really only 3, Malcolm X, Watership Down, and Howard’s End. Like the versions of Wrinkle in Time and The Chosen these kind of dense books end up feeling muddled, long and convoluted as a movie, which makes sense given they are such dense books! 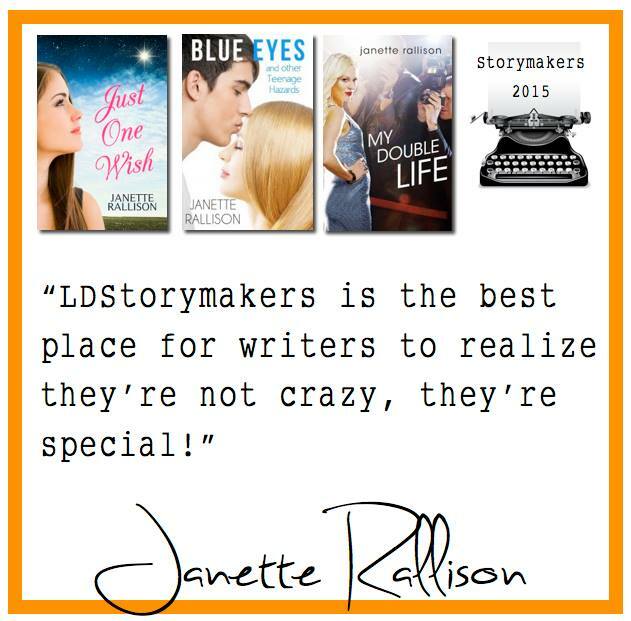 Another great year at the LDS Storymakers Conference has come and gone. 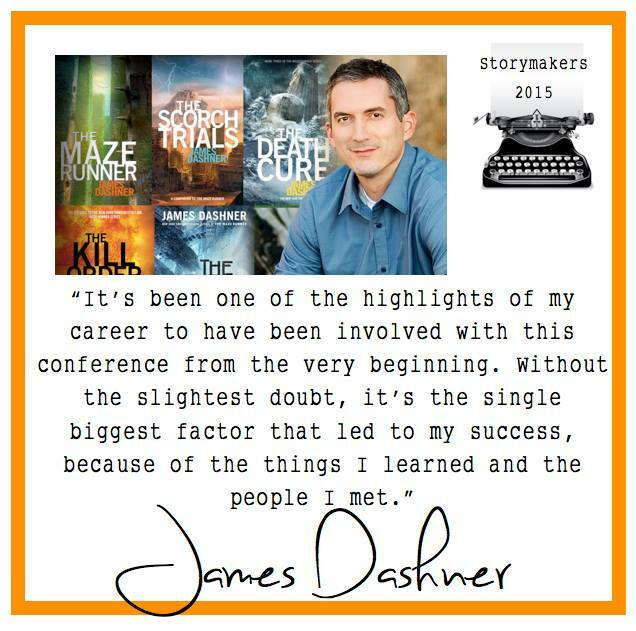 Storymakers is a conference for Mormon writers where we can take all different kinds of classes and lectures on every part of the writing and publishing process. This was my 3rd year attending and once again I had a great experience. I feel a renewed commitment to improving my writing on this and my other blogs! The cool thing about the conference is it is helpful for bloggers and Nanowrimo writers like me but also great for actual published authors. And it’s not all just religious writing. Most of it is pretty squeaky clean but all different genres are featured and discussed in the conference. If I was just a reader I think the conference would be good and well worth the cost. It is also a fun time to interact with friends and make new friends. My writing buddy Emilee was there and we had a good time catching up. 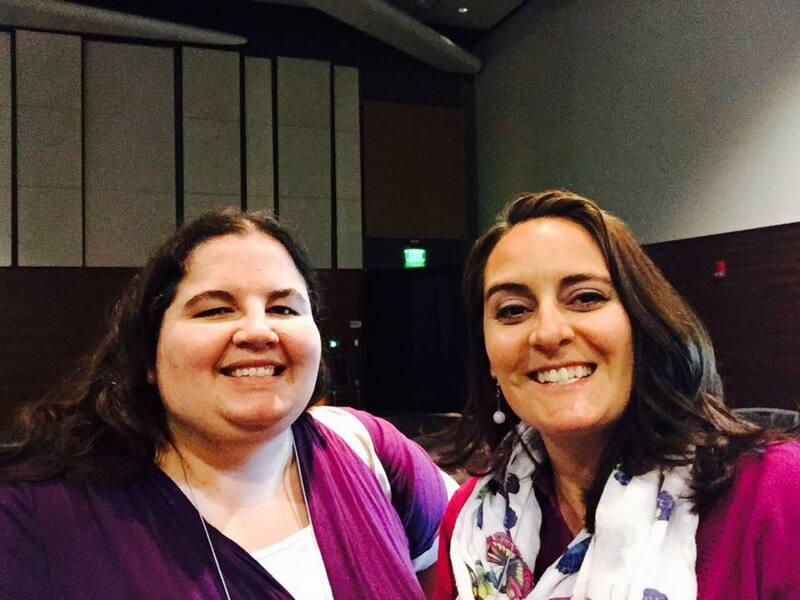 The highlight of the conference was the Friday night keynote by Martine Leavitt. I wish you could have all heard it. The tamber of her voice was very meek and soothing but then this incredible profundity kept coming out. It was so well written and moving. She talked about her 2 worlds, a gospel world and writing world and how living both to its fullest have made her the best version of herself she could be. She then spoke about her life and the lessons she’d learned a long the way including self confidence, humility, hope, hard work, children and faith. “I think it’s more likely your children will turn out just fine precisely because they have a happy parent who is happy because she writes”. I’m not a parent but I think we all can feel guilty on occasion for taking time to develop our talents. Her point is our children, the world, our loved one’s are going to be better off if we are happy and especially happy writing. I think that goes for my blogging a well as novel writing. I am happy when I’m blogging and I hope that makes the world a little bit better. I’ve thought about that many times with my blogging- wondered about the readers out there and what your struggles might be. Wondered if there is anything I could say that might help you? You guys don’t know how much I love every last one of you who reads this silly blog! Anyway, it was an excellent speech! There were many other great moments of the conference. My sleeping has been bad lately so that mad the morning sessions a little bit difficult but I still got a lot out of it. I really loved a lecture from Anne Perry on characters. I took classes on romance writing, using food and music, blogging and more. All very helpful. If I was going to provide some feedback I wish there were more classes on social media like there have been in the past and I didn’t care for the food (who knew I was such a picky eater!). Convention food is the worst! But it was a lovely weekend and I left feeling enlightened, overwhelmed and excited. So it’s here! 1000 posts! Can you believe it? I’ve thought of a lot of different things I could do to celebrate but after sharing my favorite post for 999 I thought I would take a look at my very first post on this blog. Before I start I will say that I in no means make light of those who are without work and facing the extreme trial of unemployment. My experience was unique and from the perspective of a young 28 year old girl who finally found a happy spot in her life. May 12, 2008 I wrote The Freedom of Joblessness.At the time I had been unemployed for 5 months and because I had been so unhappy in my previous job it was not as difficult a time as you might expect. It was exciting and it felt like I had a renewed lease on life. I had also just graduated with my MBA in April. At the time it seemed like I had been set free from a corporate penitentiary and I wanted to blog about it! I think there is something to that. Why do we have this assumption that if a person isn’t participating in paid labor they are doing nothing? If I won the lottery and could make it I would quit my job in a heartbeat even though I love my job now. The amazing thing is about 10 days after this post my Dad asked me to start working managing his rentals. I did that for about a year working from home. Before I knew it I was working for Grabber part time. Then full time and then over to Poler, Now Kobayashi All working from home! When I look at everything good in my life including this blog it all started with the tough decision to quit my job. To place my happiness above all the other factors and go for it. That joy felt freeing and peaceful and it still does and perhaps that’s why I keep blogging. It was liberating then and it is liberating now!